Jorge Grant scored twice against Tranmere. 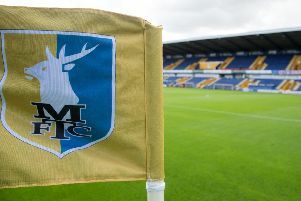 Two-goal Jorge Grant said practice makes perfect as his textbook free kick set Mansfield Town on the way to a 3-0 home win over 10-men Tranmere Rovers today. Grant won a second successive man of the match award at the One Call Stadium and said his perfect free kick was down to hours of practice. “I was practising them yesterday,” he said. “They weren't great. I put a lot over the bar but was happy this one today went underneath it. “It's something I have practised from a young age. My dad and I used to go down to the field and practice, practice, practice. Grant netted a second in the second half and said: “Three goals would have been nice but I am happy to score two and get the win for the boys. “We kept it solid at the back as they are a good counter-attacking side. On his man of the match accolade, he said: “I was given it last time we were at home as well, so I am really happy. “I always give 100 per cent for the team and on the ball try to show my ability as often as possible. “This is a really good team. Defensively we are so solid – I think they had one chance with a first half header from a corner. Grant netted 19 goals last season, and that feat has now been equalled by fellow Forest loanee Tyler Walker, who bagged the other goal. “I got there last year and I said to him you need to beat me and he has matched me. So I am really happy for him,” said Grant.